How to start with the ultimate motherboard and build yourself your own Ultimate Desktop. The Ultimate Desktop doesn't come cheap, but you'll get what you pay for. Want a quad-processor server with performance and reliability for an amazingly reasonable price? 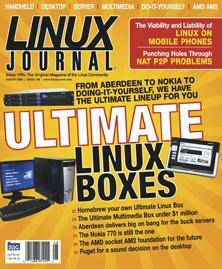 How do you create an Ultimate Linux Multimedia Center for less than a million dollars? Nothing beats the flexibility and expandability of this Linux handheld. The new AMD socket AM2 processor may not break speed records today, but it is likely to be the foundation for the future. Why equip every PC with storage and DVD writers when you can create an all-purpose network attached peripheral? Punch some holes in your network in order to make P2P work behind a firewall. Linux can be the ultimate embedded operating system if you know the secrets.